Photo: Roscoe Hersey House, ca. 1879, 416 South 4th Street, Stillwater, MN. Listed on the National Register of Historic Places in 1982. Photographed by User:McGhiever (own work), 2013, [cc-by-3.0 (creativecommons.org/licenses/by/3.0)], via Wikimedia Commons, accessed October, 2013. Washington County Government Offices are located at 14949 62nd Street North, Stillwater MN 55083; phone: 651-430-6000. Washington County is in the St. Croix River Valley on the Eastern border of the State of Minnesota. It is bounded on the east by the St. Croix River and Lake St. Croix, which forms the Minnesota-Wisconsin boundary: on the north by Chisago County; on the west by Anoka and Ramsey Counties and the City of St. Paul; and on the south and southwest by the Mississippi River, which separates it from Dakota County. The county is small — only two townships wide and six townships long — with an east-west distance between St. Paul and Lake St. Croix of less than fifteen miles. The county has a generally rolling, glacial topography, with large localized areas of level land that is good for farming. The land typically grades gently into Lake St. Croix, though at points, steep limestone bluffs line the water edge. The original vegetation was mixed oak, oak Savannah, and prairie. The pine forests so important to Washington County lumber interests lay to the north of the county along the St. Croix and other rivers. Small lakes are found throughout Washington County. Numerous streams provided early water power sites. Limestone quarries provided limited building material. Indian treaties of 1837 with the Dakotas and Chippewas opened Washington County to Euro-American settlement. The southwest and northeast corners of the county were among the first settled. Joseph R. Brown, well known in Minnesota history as an important pioneer, established a trading post and residence on Grey Cloud Island in 1838. In Marine Township, the first land claim was made in 1838 and the Marine Lumber Company was established in 1839. The first sawmill in the state was erected at Marine Mills in 1839. Settlers from the New England states, often by way of intermediate settlement in the middle west, formed the first wave of settlement along the St. Croix River in the early 1840s. A large number of Swedish settlers followed, and at Scandia established the first Swedish settlement in Minnesota. Lumbering and agriculture were important from the earliest years of settlement. Towns along the St. Croix, such as Point Douglas, Lakeland, Stillwater, and Marine were lumber centers. Inland townships were strictly agricultural. Tributary streams created power for lumber and grain mills. Joseph Haskell established the first farm in the state in 1839 in Afton Township, and in 1841 James Norris grew the state's first wheat crop nearby, in Cottage Grove. The area from Point Douglas to Red Rock provided the first commercial agriculture in Minnesota. The lumber industry flourished in the St. Croix Valley but gave way to farming as the county's most important industry after the turn-of-the-century. The county's proximity to a St. Paul urban market assured farmers of an important market. County population grew rapidly from the opening of settlement. By 1850 the population was 1,056, and the increases were sixfold over the next decade to 6,123 in 1860. In 1870, the population was 11,809. Small trade centers provided necessary services to county residents, but formal town establishment often followed actual village beginnings by a number of years. Joseph R. Brown platted the first townsite in the state in 1839, Dakotah, just north of Stillwater. Dakotah served as the county seat of the County of St. Croix, part of the Territory of Wisconsin. The town was later incorporated into Stillwater. Stillwater itself got a start with the erection of the Stillwater Lumber Company sawmill in 1843. A formal plat was not filed until 1848 by John McCusick. Two other lumber towns on the St. Croix filed plats a year later in 1849: Point Douglas, with claims to the state's first post office dating to 1841, and Lakeland. Marine Mills, site of the state's first sawmill, was platted in 1853, fourteen years after the mill was established. The mid-1850s were boom years for settlement and townsite founding. From 1855-1857, seven towns were platted along the St. Croix River: Afton (site of an 1843 flour mill), St. Mary's, Baytown, Bangor, Middletown (the latter three joined to form South Stillwater in 1873), Copas, and Oak Park. On the Mississippi, Newport was platted in 1857 and Grey Cloud City in 1856. Joseph R. Brown, proprietor of Dakotah, established Grey Cloud City on the island where he had set up a trading post in 1838. For over a decade, town founding ceased, but around 1870, rail construction prompted new activity. In 1869, the Western Land Company affiliated with the St. Paul and Duluth Railroad established Forest Lake on the route. Two years later, J. P. Furber platted Cottage Grove, formally acknowledging and clustered inland settlement already in existence. Just four miles away, the Chicago, Milwaukee, and St. Paul Railroad platted Langdon the same year. In 1873, the St. Croix Railway Improvement Company formed South Stillwater from the previously established towns of Bangor, Baytown, and Middletown. In 1874, Lake Elmo was platted as a railroad resort community. In 1882-1883, Dellwood, Mahtomedi, and Wildwood Park were established along White Bear Lake. The St. Paul and Duluth Railroad, and later the Twin Cities Rapid Transit lines, carried city residents to the lakeside resorts and amusement park. Other Washington County towns include Bayport (platted 1873), St. Paul Park (1887), Hugo (1906), Scandia (1907, some 50 years after actual settlement), and Withrow (1915). Paper towns, though not numerous, were filed over several decades: Oreka (1847), Eagle City (1854), and Shady Side Village (1880). Transportation routes have been important factors in Washington County history. Lake St. Croix and the Mississippi River provided the earliest entry into the county. Steamboat traffic and ferry connections from Wisconsin brought initial settlement. The lake served not only as a route for log removal, but provided log holding areas as well. The Fort Ripley Military Road connected Point Douglas to St. Paul via Cottage Grove after 1850 and the St. Louis River Road ran along the lake through Stillwater. Railroads have played a significant role in linking existing Washington County communities and in creating new settlement patterns. The Lake Superior and Mississippi Railroad Company (later the St. Paul and Duluth) crossed the county in 1868 as it linked St. Paul to Duluth. Forest Lake was established as an important re-fueling stop on the line. By 1872 the Stillwater and St. Paul Railroad connected White Bear Lake and Stillwater, the St. Paul and Chicago Railroad ran southeast from St. Paul through Newport to Hastings. The St. Paul, Stillwater, and Taylors Falls Railroad connected St. Paul and Stillwater. The 1880s decade saw construction of the Stillwater and Hastings Railway along the west side of Lake St. Croix and two Soo Line extensions from St. Paul to the St. Croix above Stillwater. In 1911 the Soo Line was built through Withrow. Electric interurban service of the Twin Cities Rapid Transit Company was completed from St. Paul via White Bear Lake, Mahtomedi and Wildwood to Stillwater in 1899. Summer home development along the St. Croix was stimulated by the interurban line. Highways have further encouraged urban-influenced development in Washington County. A major east-west highway provides easy access to the St. Croix from the Twin Cities. Closer to St. Paul suburban housing developments have become common in recent years. The population changes and land use pressures of the last few decades have led to incorporation of several entire townships. Settlement patterns established early in Washington County remain visible though altered in function today. River towns remain important, particularly Stillwater, the county seat, and Bayport, site of the present state prison. Smaller historic villages along the waterway thrive on recreation and tourism rather than lumbering and manufacturing. Marinas have replaced ferry crossings and steamboat landings. Inland villages serve local service functions, but near St. Paul, suburban housing developments dominate the incorporated city/townships. Rail lines still cross the county but have little local function outside of serving a few factories. Manufacturing is still important in Stillwater and Bayport, and agriculture is significant in the county economy. Building design reflects a long history of development in Minnesota, from Greek Revival structures of the 1850s to modern suburban and strip development buildings. Construction materials vary, with frame buildings dominant. Brick and stone structures exist but are common only in public and commercial buildings. Washington County's historical significance lies in its development from the late 1830s as a major lumber-oriented node, center of the earliest early settlement in the state, and agricultural county, to its emergence as an important exurban recreational area for the Twin Cities. County and local services developed over the years remain vital parts of Washington County. The early importance of the St. Croix River as a transportation corridor, the water-power sites developed on major streams, and timber resources within the county's reach stimulated settlement in the region. Proximity to Fort Snelling and the Twin Cities, and early opening to Euro-American settlement, played a key role in the county's early years. Railroads after 1870 reinforced existing patterns as well as offered opportunities for new development. The diversity of important historical themes in Washington County is shown in its historic structures. Early settlement in Washington County is represented by a number of structures. Shortly after the county was opened to settlement, the Methodist church built the Red Rock Mission (1839, Newport; nomination in process) in present day Newport. The mission served the Sioux Indians and encouraged Euro-American settlement. Scandia is the first center of Swedish settlement in Minnesota, and the area remains a center of Scandinavian settlement. The Johannes Erickson Log House (1868, New Scandia Township: placed on the National Register in 1976) was built by a family from Dalsland, Sweden. Routes of entry were important to the early immigration into Washington County. The St. Croix River served as a major transportation route. The Log House at Log House Landing (1850s, Otisville) served as a public house during the years of considerable Swedish immigration into the area. The landing was important since it was difficult for boats to navigate north of the spot. The Captain John Oliver House (1849, Lakeland; placed on the National Register in 1977) was built by a former British Naval Officer and Boston harbor pilot who operated a ferry across the St. Croix between Lakeland and Hudson, Wisconsin. The Oliver family was closely associated with the platting of the town of Lakeland. Mitchell Jackson was another early Lakeland resident known for his agricultural pursuits, for his activity in county politics, and for platting an addition to Lakeland. He brought the Mitchell Jackson Farmhouse* (c. 1850, Lakeland) in 1854 when he arrived in the county from Indiana. Community settlement is reflected in several structures. The John Copas House (c. 1880, Marine on St. Croix, placed on the National Register in 1980) was the center of a small community variously known as Vasa, Otis, and finally Copas. The town was platted in 1857 but never successfully developed. Valley Creek was the center of early settlement from New York, centered on a gristmill. The Valley Creek Residences (1856, 1864, 1874: Valley Creek, Afton Township) were all built by New Yorkers. The community was a viable trade center but was never formally platted. Several communities were established before formal organization. The J. P. Furber House (1871, Cottage Grove) was built by the Proprietor of the village of Cottage Grove. Five Furber brothers from New Hampshire settled in the area between 1844 and 1860, but it wasn't until 1871 that J. P. Furber formally established the Cottage Grove townsite. The earliest commercial agriculture in the state began in Washington County. Agriculture remains important today. The Mitchell Jackson Farmhouse* was associated with an important farm diarist. The Grey Cloud Lime Kiln (c. 1850, Cottage Grove; placed on National Register in 1978) produced lime for agricultural use. The Charles Spangenberg Farmstead (1871-1900, Woodbury; placed on National Register in 1978) is one of the few county farms retaining a full complex of nineteenth century major farm structures, including a stone farmhouse, a bank barn, and granary. Washington County's most significant early industrial development centered on timber cutting and lumber milling. The principal sources of timber lay north of the county along the St. Croix and other rivers. Lumber camps were less important in Washington County than mills and merchandising operations. Several towns developed around sawmills. Stillwater developed as the principal urban center for lumbermen and their corporate headquarters until Minneapolis outgrew the city as timber stands played out in the St. Croix Valley and interests shifted to the Mississippi River system. Several historic sites in Washington County are associated with lumber industries. The Marine Mill Site (1839, Marine on St. Croix; placed on National Register in 1970) is important as the birthplace of Minnesota's white pine lumbering industry — the area's first major industry. The original Marine Lumber Company sawmill cut the first commercial lumber in Minnesota from trees felled in the upper reaches of the St. Croix River. The Mower House and Arcola Mill Site (1847, May Township; placed on National Register in 1980) formed the center of the lumber community of Arcola, which once included shops and employee houses. The Mower brothers, along with other area lumbermen, were active in the company that established a log boom in Lake St. Croix. The St. Croix Boom Company Site (1856, Stillwater Township; designated a National Historic Landmark in 1969) is located just north of St. Croix. The St. Croix Boom Company House and Barn (c. 1885, Stillwater Township; placed on National Register in 1980) are the only extant buildings associated with the company. For 57 years after its organization in 1857, the boom company rafted and sorted lumber cut by the valley's many lumber companies. Isaac Staples owned one of the principal lumber mills in the area. The stone power house of the St. Croix Lumber Mills/Stillwater Manufacturing Company (1850, 1900, Stillwater) still stands north of Stillwater's business district. It is the only known county industrial structure associated with Staples, a leading businessman in the county and state. Several Stillwater lumbermen built substantial residences in the city. These houses remain some of the best examples of architectural styles in the area. The Roscoe Hersey House* (1878, Stillwater) was built by a partner of Isaac Staples who played a leading role in Stillwater's lumber and mercantile development. 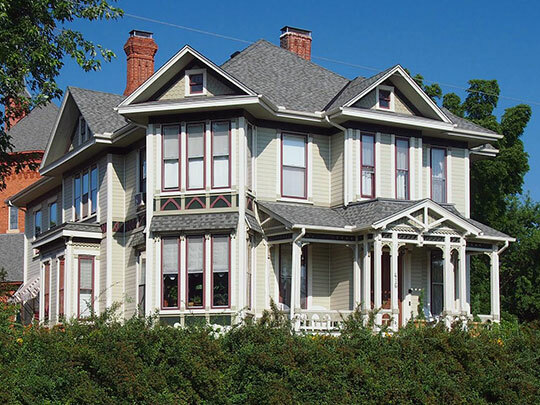 The Albert Lammers House (1893, Stillwater) is the best example of Queen Anne architecture in the city. Lammers had lumber cutting activities throughout the state. The Captain Austin Jenks House (1871, Stillwater) was built by a river pilot engaged in rafting logs. Other industrial structures of note in the county are: the Grey Cloud Lime Kiln and the Joseph Wolf Brewery* (1868-1956, stillwater) . The old Minnesota State Prison (1884-1898, Stillwater) was the start of several manufacturing firms using contracted convict labor. Several significant structures are associated with the county's transportation developments. The Stone Bridge (1860s, Stillwater; placed on National Register in 1975) served as a crossing on the St. Louis Military Road. Rail construction and operation brought the Chicago, Milwaukee and St. Paul Freight House (1883, Stillwater; placed on National Register in 1977) and the Soo Line High Bridge (1910, May Township; placed on National Register in 1977) over the St. Croix. Electric interurban service between St. Paul and Stillwater via White Bear is reflected in the Minneapolis and St. Paul Suburban Railway Company Office and Power House (1906, Stillwater). The suburban railway and later highway connections provided easy access to the St. Croix as an exurban recreation area. Croixsyde (1922, Mat Township; placed on National Register in 1980) and the Heath Summer Residence (1911, Stillwater Township ; placed on National Register in 1980) are riverside summer homes built by Twin Cities owners. The provision of county and local services are reflected in several public buildings. The Washington County Courthouse (1870, Stillwater; placed on National Register in 1971) was the seat of county government. The Nelson School (1897, Stillwater; placed on National Register in 1980) and the Hay Lake School (1895, New Scandia Township; placed on National Register in 1971) provided city and county educational functions respectively. The Pest House (c. 1872, Stillwater; placed on National Register in 1977) once served as a community institution used to control the spread of communicable diseases. Of statewide social/humanitarian significance are the Warden's House (1853, Stillwater; placed on the National Register in 1974) and the adjacent site of the Minnesota State Prison (1868-1898, Stillwater). These served as the original territorial prison (1849-1859) then the state prison (1859-1914). The buildings remaining on the prison grounds are linked to the role in local industrial development played by contract convict labor. Construction materials varied in Washington County. The Red Rock Mission, and the Johannes Erickson Log House are built of horizontal logs. Logs used in the Log House at Log House Landing bear ownership marks of the early timber companies. The Spangenberg Farmhouse, St. Croix Lumber Mill, and the Grey Cloud Lime Kiln show the use of local stone in a wide variety of buildings. Brick is used in the commercial Staples Block, the Washington County Courthouse, and the rural Hay Lake School. The Soo Line High Bridge is a rare multi-span steel arch bridge. A construction technique of particular note is seen in the Grout House (1858, Lakeland; placed on National Register in 1971). Several residences are significant primarily for their architectural design. Cedarhurst (c. 1880, Cottage Grove; placed on National Register in 1976) was the opulent country estate of Cordenio Severance, a leading St. Paul attorney. Cass Gilbert transformed the house in 1917 into a massive Neo-Colonial residence. Prominent lumberman William Sauntry built his Residence and Recreation Hall (1891, 1902, Stillwater) and housed a swimming pool, bowling alley, and ballroom in the hall that is reported to be modeled on the Alhambra. The Islamic Revival "Moorish palace" hall is a rare example of the style in the state. The Ivory McKusick House (1868, Stillwater) is the region's most striking example of the French Second Empire style. The Mortimer Webster House (1866, Stillwater) is one of the city's best expressions of Italianate residential architecture. The rural setting and Eastlake design of the Henry Stussi House (late 1870s, Stillwater Township) make it a high point in the county's rural domestic architecture. A previously listed district, the Marine on St. Croix Historic District (1839-1895, Marine on St. Croix; placed on National Register in 1974) is significant for a number of themes, including architecture, commerce, industry, transportation, and settlement. The district is relatively untouched by modern intrusions and contains important Greek Revival style structures. It includes the Marine Mill Site, birthplace of the state's lumber industry. * Submitted to the National Register as individual nominations, January, 1982. Andreas, A. T. An Illustrated Historical Atlas of the State of Minnesota, Chicago, A. T. Andreas Company. 1874. Case, John H. "Historical Notes of Grey Cloud Island and its vicinity," in MHS Collections, 15:371-378 (1915). Dunn, James T. Marine on St. Croix: From Lumber Village to Summer Haven, 1838-1968. Marine on St. Croix: Marine Historical Society, 1968. 105 p. Expanded version of the author's Marine Mills: Lumber Village, 1838-1888. Marine on St. Croix, 1963. Easton, Augustus B., ed. History of the Saint Croix Valley. 2 vols. Chicago: H.C. Cooper, Jr. & Cob, 1909. Washington County, vol. 1, pp. 207-484. Folsom, William H. C. Fifty Years in the Northwest. Ed. by E. E. Edwards. [St. Paul]: Pioneer Press Co., 1888. Washington County, pp. 355-431. Glaser, Emma. "How Stillwater Came to Be," in MH, 24:206 (Sept., 1943). Gray, James. "Gentility in a New New England," in Thomas C. Wheeler, ed., A Vanishing America: The Life and Times of the Small Town. New York: Holt, Rinehart & Winston, 1964, pp. 94-108. Loehr, Rodney C. (editor). Minnesota Farmers' Diaries. St. Paul, Minnesota Historical Society. 1939. McCollum, E. J. "The Story of the Railroads of Washington county." Stillwater Gazette, May 20, 1937. Neill, Edward D. History of Washington County and the St. Croix Valley. Minneapolis. North Star Publishing Co., 1881. Newman, Mildred A. The Rutherford Neighborhood, 1854-1969. Stillwater: Croixside Press, 1969. 85 p.
Northwest Publishing Co. Plat Book of Washington County, Minnesota. Minneapolis, Minn., Northwest Publishing Co. 1901. Palliser and Palliser. Palliser's American Cottage Homes. New York. George Palliser. 1878. Roney, Edgar L. Looking Backward: A compilation of more than a Century of St. Croix Valley History. — 109 p. /Stillwater/: Privately published, 1970. Rosenfelt, Williard E. (editor). Washington: A History of the Minnesota County. Stillwater. Croixside Press. 1977. Stillwater, Minnesota: The Metropolis of the St. Croix Valley. St. Paul. Railway Publishing Company. 1903. Stillwater Trades Review. Stillwater. Easton and Masterman, Publishers. January, 1898.